Drinking at least one glass of low sodium vegetable juice every day may help overweight people to lose more weight, new research has found. In the study, adults who drank at least 8 ounces of vegetable juice as part of a calorie-controlled heart-healthy diet lost 4 pounds over 12 weeks, while those who followed the same diet but did not drink the juice lost only 1 pound. The 81 participants in the study all had metabolic syndrome - a cluster of risk factors including excess body fat around the middle, high blood pressure, high blood sugar and low levels of HDL ("good") cholesterol. These risk factors place them at increased risk of diabetes and heart disease. All of the study subjects followed a heart-healthy diet, which was high in fruits, vegetables, fiber, minerals and dairy products and low in saturated fat and salt. In addition, they were randomly assigned to drink 0, 1, or 2 cups of low sodium, high potassium vegetable juice every day for 12 weeks. The vegetable juice drinkers - in addition to losing more weight over 12 weeks than the non-juice drinkers - were also more likely to get the recommended 3 to 5 servings of vegetables daily. 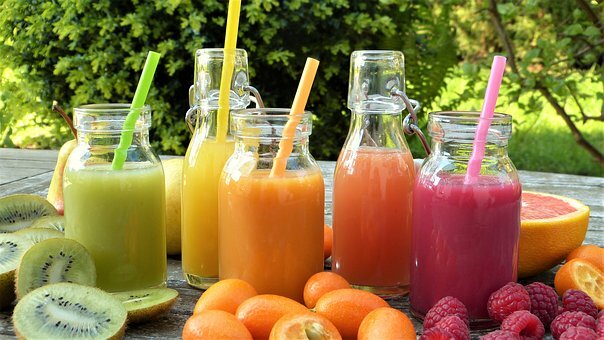 Vegetable juice drinkers also significantly increased their intake of Vitamin C and potassium, while decreasing their overall carbohydrate intake. "What we found in this study is that drinking vegetable juice seemed to address some of the key barriers to vegetable consumption such as convenience, portability and taste, so individuals were more likely to meet their daily recommendations,"
"Furthermore, vegetable juice drinkers reported that they actually enjoyed drinking their vegetables, which is critical to adopting dietary practices for the long-term." The results of the study were presented at the Experimental Biology convention in New Orleans.